When a child begins screaming in the middle of the night, inconsolable but remaining asleep, he is experiencing a sleep terror. This episode is sometimes called a night terror, but it doesn't necessarily have to occur only at night, but it always happens out of sleep. Sleep terrors can be greatly distressing for those witnessing them, and they are clearly distinguished from nightmares. What are the symptoms of sleep terrors, what causes them, how long do they last, what stage of sleep are they associated with, and what treatments work best? Sleep terrors are a type of parasomnia that typically affects children, though it can also be seen in adults, however less commonly. 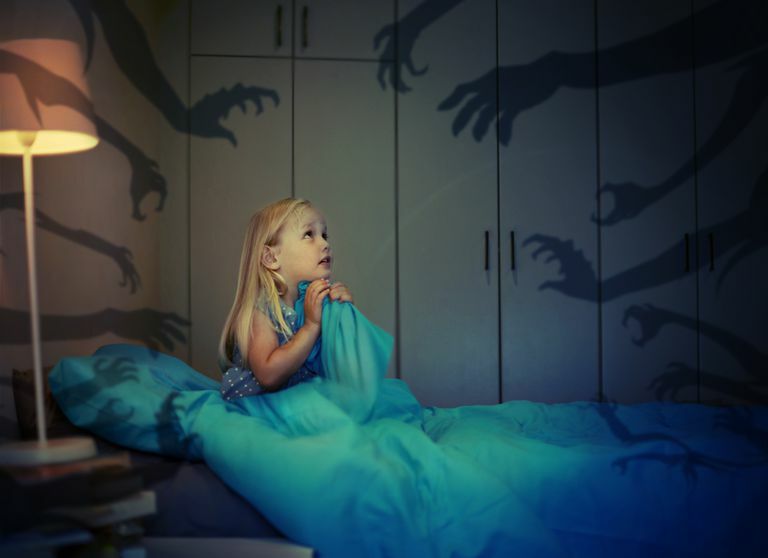 It is estimated that 1% to 6% of children experience night terrors. Many children experience these episodes between the ages of 4 and 8, and they may more commonly affect boys. Most often, a child who is experiencing a sleep terror may seem unresponsive and even combative. They typically last for minutes but can be prolonged, especially if the child is not allowed to easily fall back asleep. What Stage of Sleep Contributes to Sleep Terrors? Sleep terrors arise from non-rapid eye movement or slow-wave sleep during the first few hours of sleep. Most slow-wave sleep happens in the first third of the night, and this is when sleep terrors would be most likely to occur. As this is a deep stage of sleep, it will often be very difficult to wake the child, and he will be confused once awake. Though it may seem impossible, these episodes are usually not remembered by the child the next morning, especially if the child falls back asleep. This helps to distinguish them from nightmares, which usually involves a child who is appropriately responsive, able to describe the fear-provoking dream, with intact recall the next day. Sleep terrors seem to occur when deep sleep becomes fragmented. This may be more likely in periods of stress, with sleep deprivation or irregular sleep patterns, or secondary to other sleep disorders like sleep apnea. It is important to differentiate these episodes from seizures that occur in sleep, as seizures can also cause unusual behaviors, confusion, and often are triggered by sleep transitions. Your child's doctor will ask questions about sleep experiences and medical history. It will be important to rule out any risk factors for seizures, such as difficulties at birth, head trauma, and prior infections affecting the brain called encephalitis. A careful history may be enhanced in some cases with a polysomnogram (an overnight sleep study) to help reach a diagnosis. The sleep study will identify other causes of sleep terrors, such as sleep apnea. Children experiencing night terrors will show arousals from slow-wave sleep when tested. In many cases, treatment is not necessary. You'll likely leave your child's doctor's office with nothing more than reassurance that the scary nighttime events are nothing to be concerned about. Though that may seem unsatisfying at first, it's important to remember that - though upsetting to you - these events are not affecting your child's health. These episodes generally resolve in time as the child gets older. If it seems that your child is experiencing night terrors after doing something in particular during the day, it can be helpful to avoid those triggers. It may be useful to ensure adequate hours of sleep at night and a regular sleep schedule. Also, behavioral therapy, such as scheduled awakenings to disrupt slow-wave sleep, may be of benefit. There is also a medical device called the Lully Sleep Guardian that can be used to trigger these awakenings with the vibration of a pad that the child sleeps on. Let a doctor guide you in the selection of the best treatment, if needed. If the episodes are quite severe and disruptive, medications such as benzodiazepines and tricyclic antidepressants may also be used, but these are rarely necessary. Mowzoon, N et al. "Neurology of Sleep Disorders." Neurology Board Review: An Illustrated Guide. 2007; 738.